While not life-threatening, bloating is often uncomfortable -- and even painful -- and water retention can compound the situation, making you feel worse. If you suspect your habit of drinking diet soda is the potential cause of your bloating and water retention, you may be on to something. Try removing diet soda from your meal plan for a week or two to see if you find relief from your symptoms. 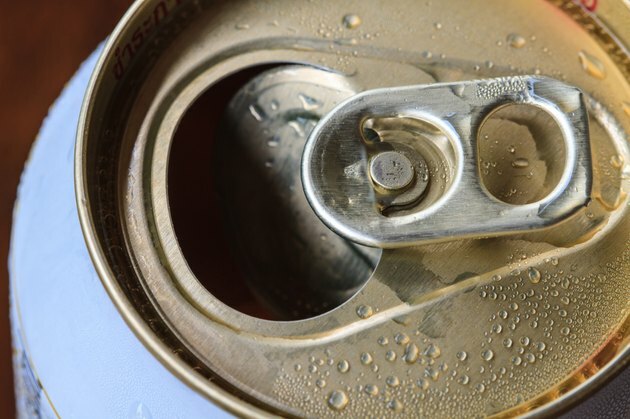 Either way, if you're a regular diet soda drinker, it's a good idea to replace soda with healthier beverages, because it may have other undesirable side effects. Diet soda contains sugar replacements such as artificial sweeteners, which greatly reduce the number of calories in the beverage. Scientist speculate that artificial sweeteners may cause or contribute to fluid retention, but well-designed studies on human subjects are needed to know for sure. As of now little evidence exists to positively prove that the artificial sweeteners in soda cause you to retain water. In a study published in the journal Appetite in January 2011, scientists tested effects of the artificial sweeteners saccharin and aspartame and fluid retention in an animal experiment. In the study, artificial sweeteners, but not sugar, caused weight gain unrelated to calorie intake that researchers speculate may have been because of water retention. While these results are interesting, this was a small, short-term study using rats, and longer-duration human studies are necessary before conclusions can be drawn. Some diet fizzy beverages use certain sweeteners that may cause or increase the risk of stomach bloating and digestive distress. For example, sugar alcohols, which are found in some diet sodas and other diet foods, cause digestive issues such as gas, bloating and even diarrhea in some people. The amount needed to cause gastrointestinal upset varies greatly from person to person. Some people can tolerate a moderate amount of sugar alcohols, while others experience gas or other side effects with small amounts. Sugar alcohols end in "-ol," which includes sorbitol, xylitol and mannitol. If you see any of these listed in the ingredient list of your diet drink, it's sweetened with sugar alcohols and may be causing the bloating you're experiencing. While it is inconclusive whether diet soda causes water weight gain specifically, scientists have found evidence that it may cause weight gain in general. According to a clinical review, several large-scale research studies reveal a link between artificial sweeteners and weight gain. Additionally, other studies have found that artificial sweeteners fail to help you lose weight on their own, say authors of the review. The review appears in the June 2010 issue of the Yale Journal of Biology and Medicine. A separate paper suggested that artificial sweeteners in soda fail to trigger the body's satiety mechanisms, which may increase hunger and lead to eating more calories than you would otherwise. That article was published in the July 2013 edition of the journal Trends in Endocrinology and Metabolism. Dieters typically drink diet soda as part of a low-calorie weight loss plan because it has few to no calories. However, diet soda has no nutritive value, so it's better to replace it with other calorie-free beverages. Unsweetened tea is a good option. It's packed full of antioxidants called polyphenols, which collectively contribute to your health and well being. Fermented beverages like kombucha are another good option as they provide probiotics -- friendly bacteria that contribute to digestive health. It's also vital to drink plenty of water, especially if you're following a low-calorie diet in an effort to manage your weight. Drinking water facilitates weight loss, assert scientists who conducted a study published in 2008 in the journal Obesity. Researchers followed female dieters over the course of 12 months and found that drinking plenty of water and increasing water intake are linked to significant weight and body fat loss over time. These results were completely independent of diet and physical activity, so if you want to lose weight, try drinking more water.